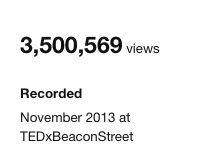 It has been a little over 4 years since Leading Women CEO, Susan Colantuono, took the stage at TEDxBeacon Street and we are happy to announce that 'The career advice you probably didn't get' has now surpassed 3,500,000 views! We would like to take this time to thank you for your support of Leading Women and your commitment to closing the leadership gender gap. We searched TED for the most viewed, most fascinating, most informative talks on women in business and on leadership and created a list of TED Talks that everyone should watch. Here's our list. Continue reading to see why! So we leaned in... now what?